Welcome to the Career Center. If you have considered becoming a certified Golf Fitness Pro, PGA Teaching Pro or a general Fitness Pro, get started today by using the links below.. Golf Fitness - Join the men and women who have become Certified Golf Fitness Trainers and become part of the fastest growing sport in the world! This program was developed by Kelly Blackburn, the PGA TOUR & Champion TOUR fitness consultant. See Program. 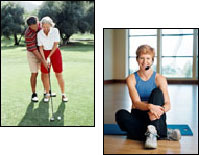 PGA of America is the major association of certified Golf teaching professionals. Click here to become a certified golf teaching professional call PGA of America headquarters at (561) 624-8400. The Aerobics & Fitness Association of America houses top certified fitness professionals including group and private trainers! Click here to become a certified fitness professional! Why teach Golf and Fitness? What's in it for me? i.e., PGA TOUR professionals. Added distance off the tee, increased power behind the ball, more consistency through 18 holes, a higher level of stamina for the finishing holes and increase in overall fitness! Let's say you teach 20 sessions per week. Based on the Atlanta market figures, that's an income of $1,440 per week. In your first year you could potentially add $74,880 to your bottom line!